See this is why I can’t watch sports. Mainly because 97% of the time, I have zero idea who’s on first and what’s on second and what match is this and why are they wearing fanny packs on their butts and where can I get one? But mostly, because WHEN I watch, the team loses. I didn’t watch the Chiefs AT ALL, ONE SINGLE SECOND, until Sunday night for five minutes. I get so stressed out! And INVESTED PRONTO (which is odd for someone who genuinely doesn’t care), and then I sweat, start screaming at all the inflated egos on the t.v., and stick a carb in my face. I can’t watch sports. Just can’t. You can basically blame me for the Chiefs loss on Sunday night. But! I can do this. THIS. This is my game. 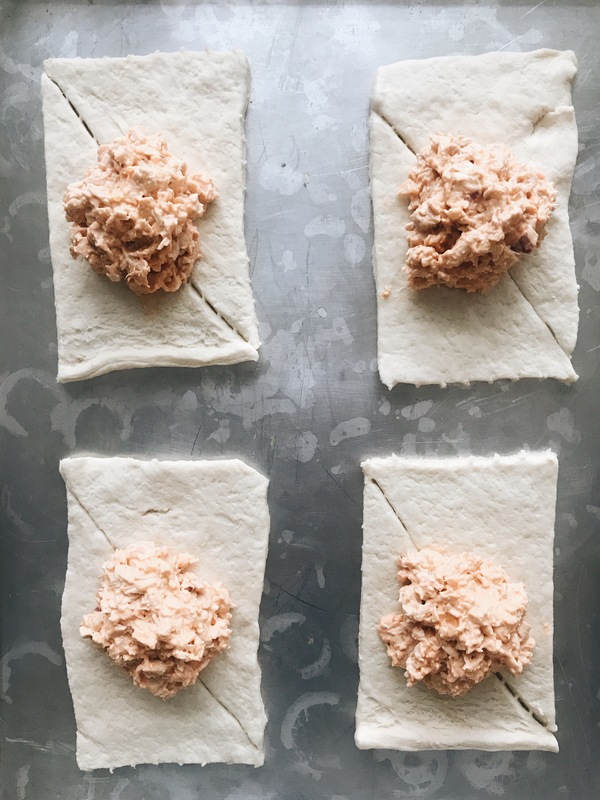 Not sure if you remember a few years ago when my mom gave me her Baked Chicken Squares recipe, and then I put it on this here internet website URL, and we all ate with glee. ‘Member? WELL, I put a spin on it and made you the game day version! And when I say “game day” I mean bowling or ping pong, because I can’t watch sports. You now know this. Crazy simple. You’ll boil a couple of chicken breasts. Then give them a good chop. Like super chop. Bonkers chop. Then violently throw them into a mixing bowl, and add (softened) cream cheese, a little bit of butter, the diced red onion, and Frank’s wing sauce! Evenly dollop the chicken mix among eight dough rectangles. Then gently pull up the tips to the center, pinch them together into little purses! At least that’s what the kids call them. 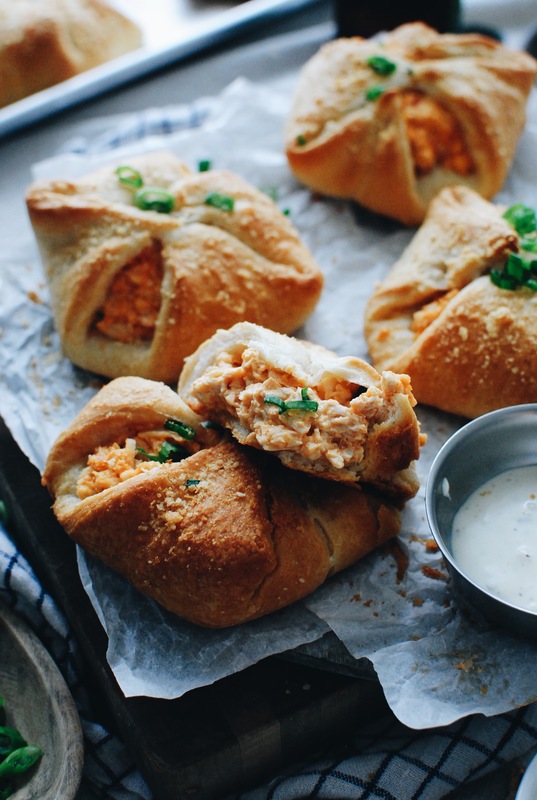 Buffalo chicken purses. I’ll call my therapist. Viola! About 25 minutes in the oven until the tops are puffed and golden brown. And of course the cream cheese warms and softens even more, but without any oozing! That’s the beauty of cream cheese. It stays tucked and offers tang. Oh! Let’s start a band called Stays Tucked and Offers Tang. None of those words were good. 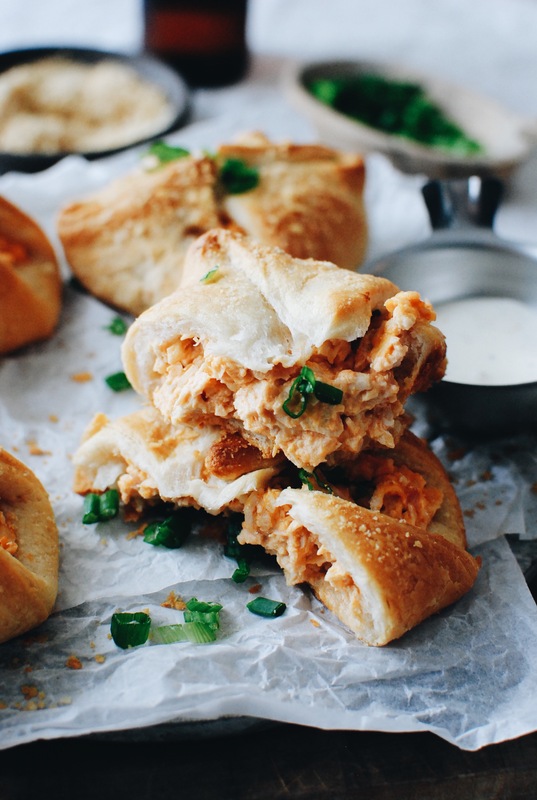 Serve them with ranch or blue cheese dressing, and I DARE you to not try and eat six in one sitting. You know what! 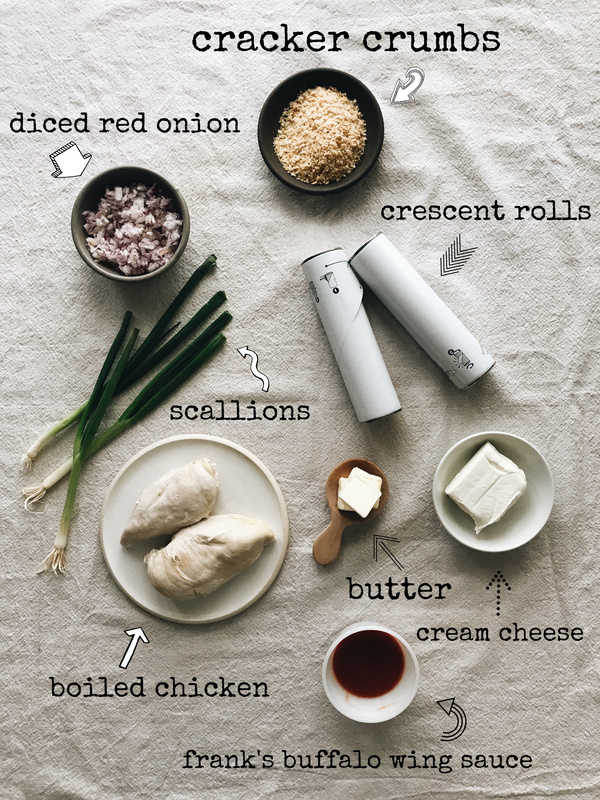 You could even add finely minced celery to the mix, and blue cheese crumbles. Go crazy with this. I kept it simple because five year olds. 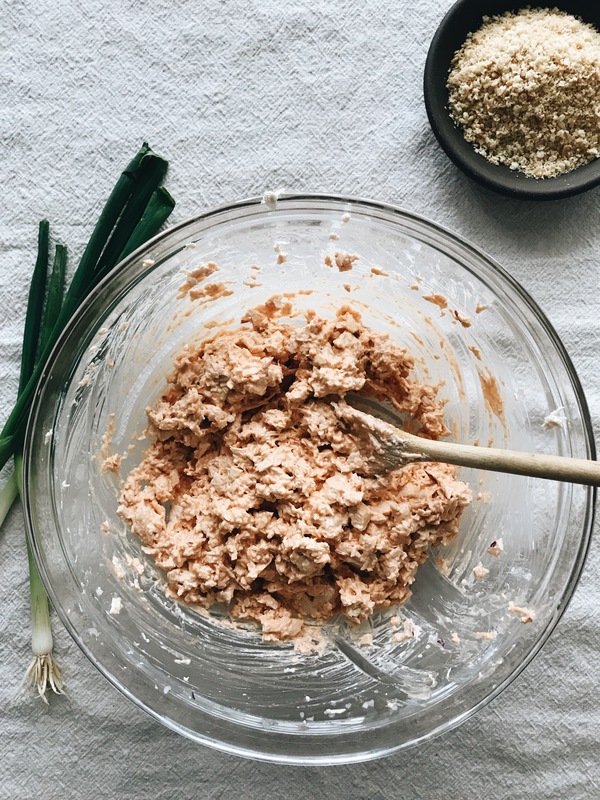 In a large bowl, mix together the chopped chicken, diced red onion, cream cheese, 1 Tbs. melted butter, the wing sauce, and a pinch of salt. Stir until fully combined. 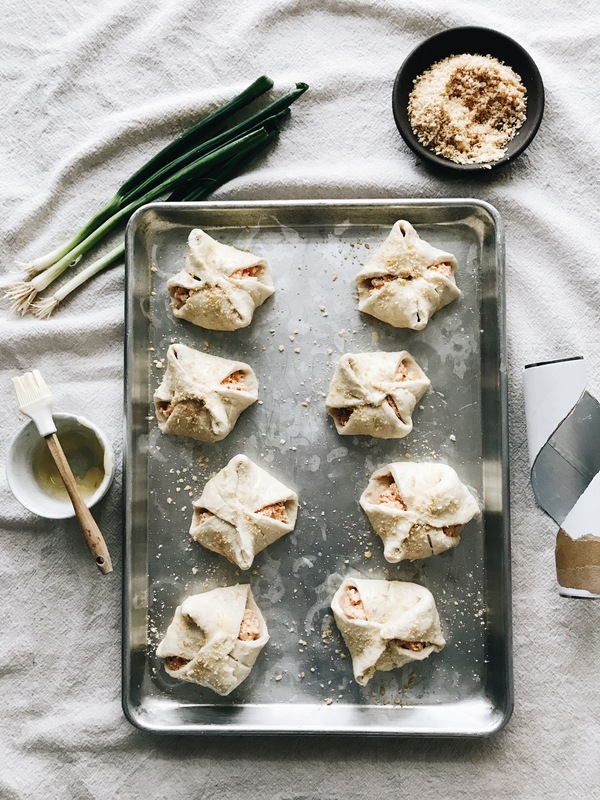 Roll the crescent dough out to make eight rectangles. (Leaving two triangles pinched together the perforated seam.) Dollop the chicken into the center of each rectangle. The mix should perfectly even out over all the dough. Pull the ends up and pinch together in the center, creating little pockets or purses. Brush the remaining 2 Tbs. melted butter over the tops, and sprinkle the cracker crumbs on top. 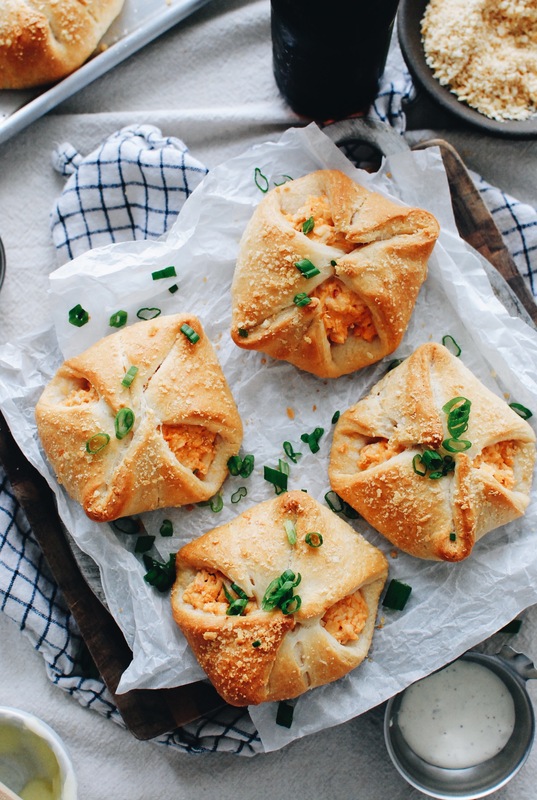 Bake anywhere from 17-25 minutes, until the squares are puffed and golden brown. 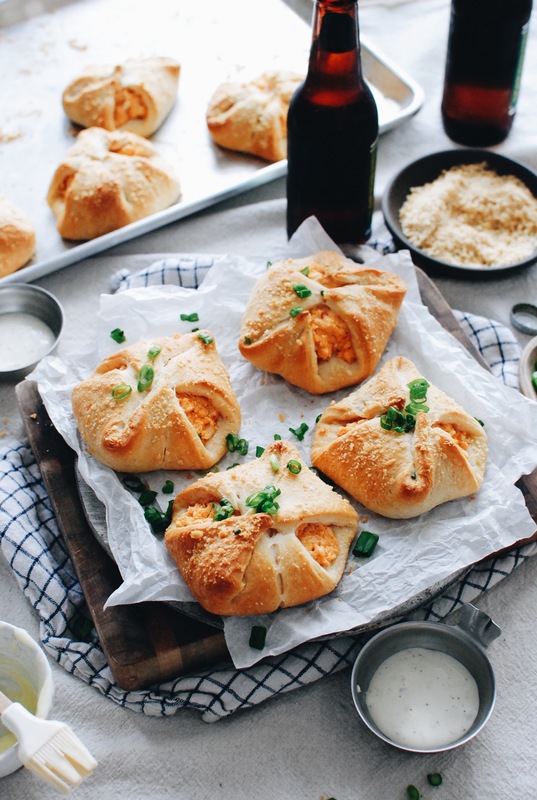 Garnish with chopped scallions if desired, and serve with Ranch or blue cheese dressing! Don’t even try to get me to watch sports again. Can’t do it won’t do it. I fully believe in sports superstitions, so it is 100% your fault they lost. When my beloved Hou Astros were in the World Series a couple years ago, I could not watch any of the games because I hadn't watched them all season. And they won. Point made. 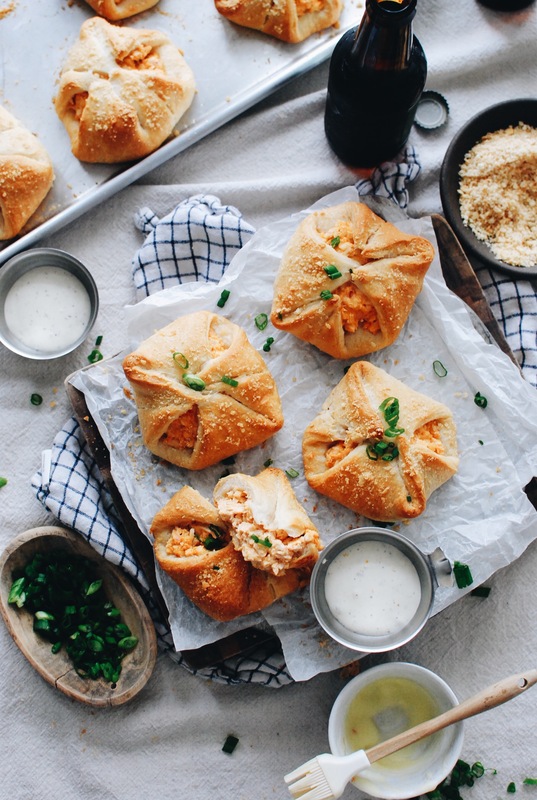 oooo...I think I might try this for super bowl sunday, tho I'll probably use goat cheese instead of cream cheese because of my lactose intolerant husband. I like the idea of putting celery and blue cheese in the mix too!